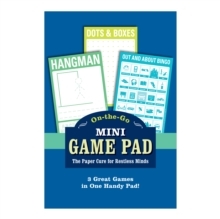 We asked ourselves how we could make our add link On-the-Go Game Pads a little more travel-friendly, and upon deep meditation, we found the answer: make them smaller! Ideally sized for pockets and packs, these road buddies are the remedy for the backseat, train seat and plane seat blues. Fun activities for kids to make voyages bearable for all.